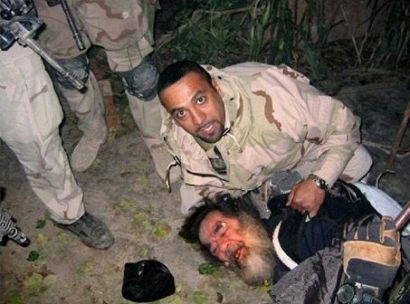 Saddam Hussein is captured on December 13, 2003. Has Iraq just exchanged one dictatorship for another? "Yes we got rid of a dictator, but we're cursed with new ones who play the power game according to their whims and tendencies as if they aren't responsible for the security and safety of the people. In Iraq, every official without a conscience has the power to kill or make people disappear. What kind of liberation is this, which Iraqis are paying for to this very day?" Former CIA Director George Tenet: His book, released in 2007, still makes the blood of many Iraqis boil. TIKRIT, Iraq: Two days ago I was reading the book At the Center of the Storm by George Tenet, the former CIA director, in which he says he sat behind Colin Powell at the United Nations and knew he was lying about the information he provided on Iraq, its prohibited weapons and al-Qaeda. He writes that his conscience will never rest because of the consequences of this completely unjustifiable conflict. 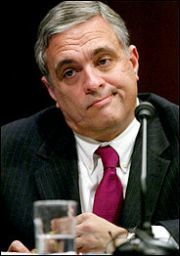 [Editor's Note: In his book, George Tenet doesn't admit to lying - only to having mistakenly submitted bad information. And while saying that his conscience is troubled, he doesn't admit that the war was unjustifiable]. Where Tenet’s statement ends, the curses of Iraqi mothers, wives and girls who lost their loved ones in an absolutely unjustifiable war begin. The Arab world is full of tyrants and dictatorships supported by America and other countries that are labeled "great." Iraq was a model of tyrannical dictatorship, and for a moment in 2003, we had hoped that its oppressive system would change when we accepted the helping hand of those who came on the backs of American tanks. They fought a holy war against tyranny in order to liberate the nation and the people. But the price was over a million Iraqi widows, three million orphans, and the ruination of the country and people. I believe that it is an unjustified liberation, as well as a totally unjustified war. I assert that if Mr. Tenet or anyone else who took part in producing this war of lies should take the time to visit any Iraqi market. There he would find the living witnesses of a war America embarked on to change its tyrant and find someone else to fill the transitory seat of power. There in the market, Tenet would find dozens of children who haven't even reached the age of ten doing jobs of drudgery just to obtain the money for a meal for them and their families, because their fathers were killed or arrested and a secret informant. Isn’t your conscience stirred when you see an infant on its mother’s lap - begging? Aren’t you moved to see a small Iraqi girl "being sold off" at the market to provide for her mother and brothers? Isn’t your conscience moved to see a bereaved mother who lost her only son because he had a dispute with such-and-such party? Mr. Tenet, this is a dirty war. What reward will you reap after the land has become desolate for even the last one on it? Yes we got rid of a dictator, but we're cursed with new ones who play the power game according to their whims and tendencies as if they aren't responsible for the security and safety of the people. In Iraq, every official without a conscience has the power to kill or make people disappear. What kind of liberation is this, which Iraqis are paying for to this very day?